Use your iPad as a multi-alphabet keyboard for your Mac! Get the Touchboard Global App for your iPad for free on the Appstore. 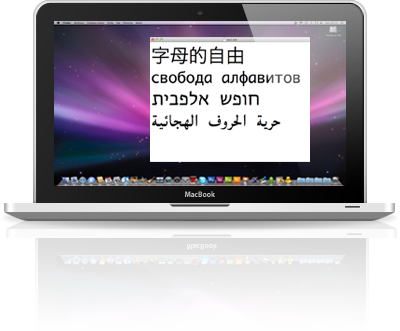 Download the Touchboard Receiver for free and install it on your MacBook or desktop mac. Run Touchboard on your iPad and connect to any Mac that runs the Touchboard-Receiver and is in the same Wifi. Choose a keyboard layout by holding the globe key. You can add new layouts in your iPads settings. How can I add more layouts to my iPad's Keyboard? The iPad has layouts for more than 50 languages. To add new keyboard layouts on your iPad you can choose them in your iPad's settings under General -> Keyboard -> International Keyboards -> Add New Keyboard. 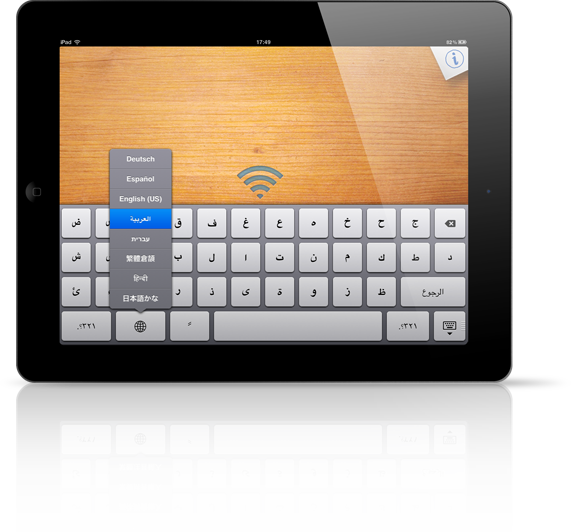 You can then choose the different layouts directly in the app by holding the globe key of your iPads Keyboard. When i run Touchboard Globe on my iPad a "No devices" message appears although "Touchboard Receiver" is running on my mac. What happens? Your iPad and Mac have to be connected to the same wireless network to be able to communicate with each other. Please check your wifi settings on both your iPad and Mac. When i install and open Touchboard Receiver on my Mac nothing happens. Have i done something wrong? We have made the Touchboard Receiver Application very unobtrusive, it shows just the Globe icon on your Mac's top bar, providing a few fundamental functionalities. So if the Globe icon is there, the app is running correctly. Does Touchboard work with Bluetooth? No, the communication between the iPad and the Mac application can only be established through wifi. Which programs can i use with Touchboard? Touchboard works as an extension of your computer so you can use it to type everywhere you want, text processors, internet browsers, chatting software… Everywhere! I have some questions or want to make a suggestion to improve Touchboard. How can i contact you? We are thankful for any kind of feedback and improvement suggestions. You can send us an email to contact@touchboard.eu.